When the idea of the cable locking system first came to me, it was to assemble and disassemble the means of holding the beams for the deck of a suspension bridge. How it was to be produced and what that might cost were of secondary consideration then. After working out just how I would have it made, I found a manufacturer that would do the job, and it was a reasonable cost. 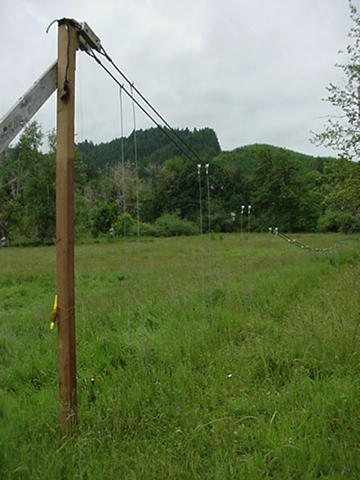 It was a long process getting the patent for the cable locking system, but once that was accomplished we set about writing a book – Building a Small Cable Suspension Bridge with the Cable Locking System. The book was meant to promote the cable locking system and talk about all the steps we took to build the bridge. About a year later, some people were asking about purchasing CLS components. We had three companies that could do the job, but we were only considering about 50 “units.” After some waiting they gave quotes on 100 or 300 units. The prices seemed expensive, and after informing the interested buyers, we heard no more from them. The cost of production seemed to be a problem and we weren’t willing to buy and store parts in case someone ordered them. So I wondered: Can I simplify the CLS so that it could be produced more cheaply, and by just about anyone, with a minimum of tools? I came up with a possible answer. The new system has some drawbacks, in that it has to be placed beneath the beam during assembly as opposed to slipping the beam into the original CLS. Also, the beam has to be pre-drilled and a PVC tubing should be inserted to protect the cable from corrosion. But overall, assembly is not all that different from the original cable locking system design. Picture a swing: hung by two ropes (chains, cables, etc) one on each side. 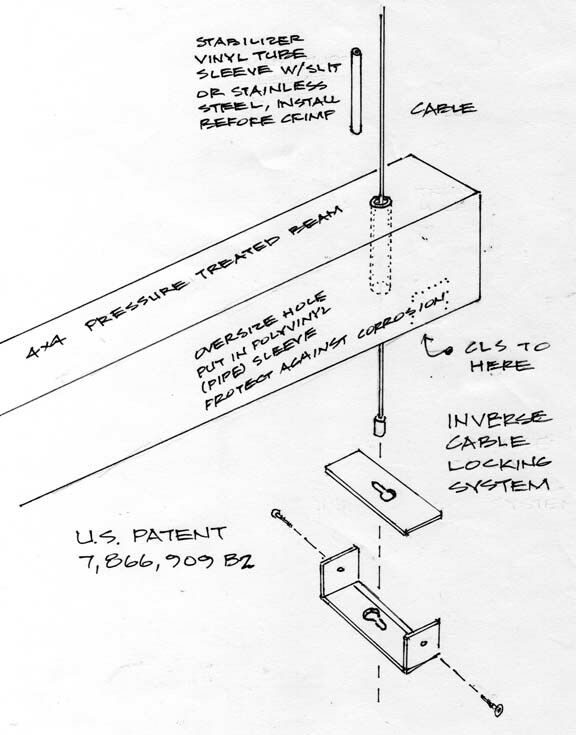 To assemble the “inverse” system, while cradling the beam in your lap, grasp the first of the two suspender cables, push it through the pre-drilled hole ( with tube protector) such that the cable can be inserted through the “inverse” CLS. Pull tight. Proceed to other side and repeat. A screw through the side of the inverse will lock it to the beam so that it can’t move about. I actually use a screw in my original design, if you noticed in the book. Hopefully this design will be something more affordable and something that people can have made locally without a lot of hassle. I prefer the original set-up for ease of assembling “on the fly” and less intrusion to the beam, but this is an option for you to consider. To Gallop or Not to Gallop? Another consideration when building my suspension bridge was harmonic resonance. While harmonic resonance was not completely to blame for the failure of Galloping Gertie (http://www.wsdot.wa.gov/tnbhistory/Connections/connections3.htm), I decided to address the problem because it could be an issue. After all, the bridge was bound to be a little bouncy, so why make it worse? All objects have a frequency or a set of frequencies with which they will naturally resonate when disturbed in some way – be it plucking a guitar or stepping on a bridge deck. Each of these natural frequencies is associated with a wave pattern. When the object resonates at one of its natural frequencies, it vibrates in a manner so that a standing wave is formed within the confines of the object. In the case of resonance for this bridge, the waves will bounce back and forth between two boundaries: the posts. Nodes are always at equally spaced intervals where the wave amplitude (motion) is zero. The points where the cable connects to the post are two nodes. 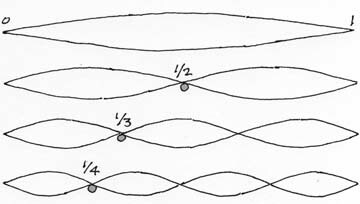 There is a possibility for one node in the middle, at third points, at quarter points, and so on, as seen in the previous drawing showing standing waves. The more excitation, the more nodes will potentially form. I decided to space the suspenders so that they were not positioned on the nodes of the bridge span. I determined the exact points on my string model, then just moved the suspenders a couple of inches over to avoid the nodes. I assembled everything on dry land according to my plan so that I could tweek things fairly easily. The final product doesn’t bounce much, unless two people and a dog are all walking on it at the same time. 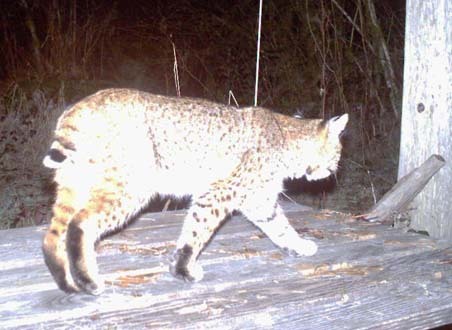 Or maybe a bobcat. But at least my bridge doesn’t gallop! You can read more in my book, Building a Small Cable Suspension Bridge. There is a link to purchase it on my website: http://www.wildcatman.com.